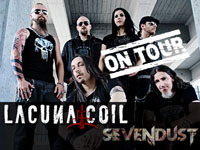 VIP passes are now available for Lacuna Coil’s upcoming February 2013 US dates with Sevendust. The package includes a Meet & Greet with the band, an exclusive Lacuna Coil T-Shirt and an exclusive signed Lacuna Coil Poster. These special packages will only be available FOR A LIMITED TIME – so hurry, and get yours NOW! You can purchase the package at packages.artistarena.com/lacunacoil. Note that the packages does not include a ticket to the show, so you’ll need to purchase this separately from the normal ticket outlets. Address: 170 W. 9th St. Winston-Salem, NC. Address: 2620 Onslow Dr. Jacksonville , NC. USA 28540. Address: 223 North Water Street Lancaster , PA. USA 17603. Address: 1208 Route 146 W. No. Country Commons Clifton Park , NY. USA 12065. Address: 121 Center Street Portland , ME. 04101. Address: 409 W. Dickson St.. Address: 300 President Clinton Ave. Address: 115 King Street Madison, WI 53703. Address: 209 E. Washington St.. Address: 222 South Michigan Street. Time: 6:00pm. Age restrictions: No Minors. Address: 1850 S. Clack St..
Time: 6:30pm. Age restrictions: All Ages. Address: 515 E. Main Street. Time: 7:00pm. Age restrictions: All Ages. Address: 416 South 9th St.
Time: 7:00pm. Age restrictions: All Ages. Address: 211 N. Virginia Ave..
Time: 7:00pm. Age restrictions: No Minors. Address: Casino 4111 Boulder Hwy..
Time: 8:00pm. Age restrictions: No Minors. Address: 5459 Dehesa Rd..
You can see all upcoming Lacuna Coil dates in our Tours section.